Chronic pain challenges the central tenet of biomedicine: that objective knowledge of the human body and mind is possible apart from subjective experience and social context. Sufferers, finding that chronic pain alters every aspect of life, often become frustrated and distrust a profession seemingly unable to explain or effectively treat their illness. The authors of this innovative volume offer an entirely different, ethnographic approach, searching out more effective ways to describe and analyze the human context of pain. How can we analyze a mode of experience that appears to the pain sufferer as an unmediated fact of the body and is yet so resistant to language? With case studies drawn from anthropological investigations of chronic pain sufferers and pain clinics in the northeastern United States, the authors explore the great divide between the culturally shaped language of suffering and the traditional language of medical and psychological theorizing. They argue that the representation of experience in local social worlds is a central challenge to the human sciences and to ethnographic writing, and that meeting that challenge is also crucial to the refiguring of pain in medical discourse and health policy debates. 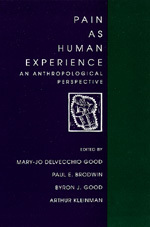 Anthropologists, scholars from the medical social sciences and humanities, and many general readers will be interested in Pain as Human Experience. In addition, behavioral medicine and pain specialists, psychiatrists, and primary care practitioners will find much that is relevant to their work in this book. Mary-Jo DelVecchio Good is Associate Professor of Medical Sociology at Harvard Medical School. Paul E. Brodwin is Assistant Professor of Anthropology at the University of Wisconsin-Milwaukee. Byron J. Good is Professor of Medical Anthropology at Harvard Medical School. Arthur Kleinman is Professor of Medical Anthropology and Psychiatry at Harvard University.